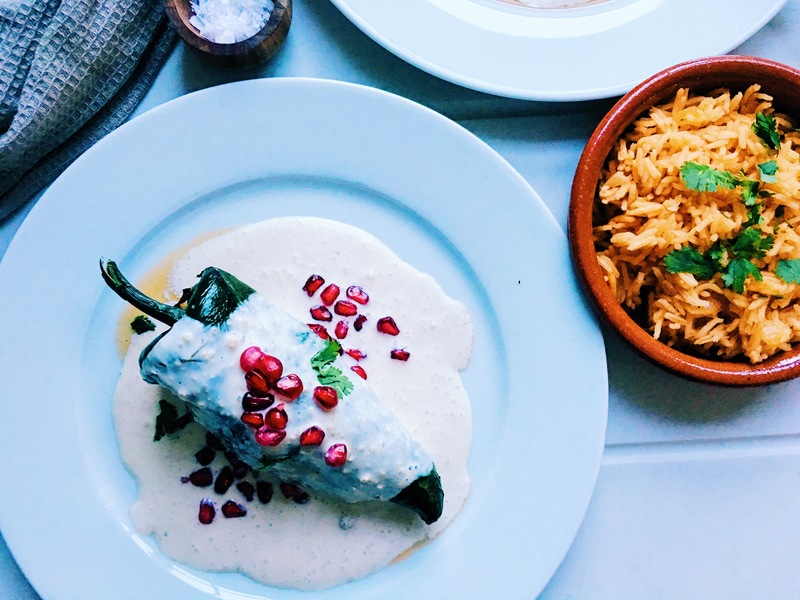 I think just a few recipes in Mexico could describe the richness in traditions of our Mexican gastronomy and Chiles en Nogada is one of those dishes; full of history. 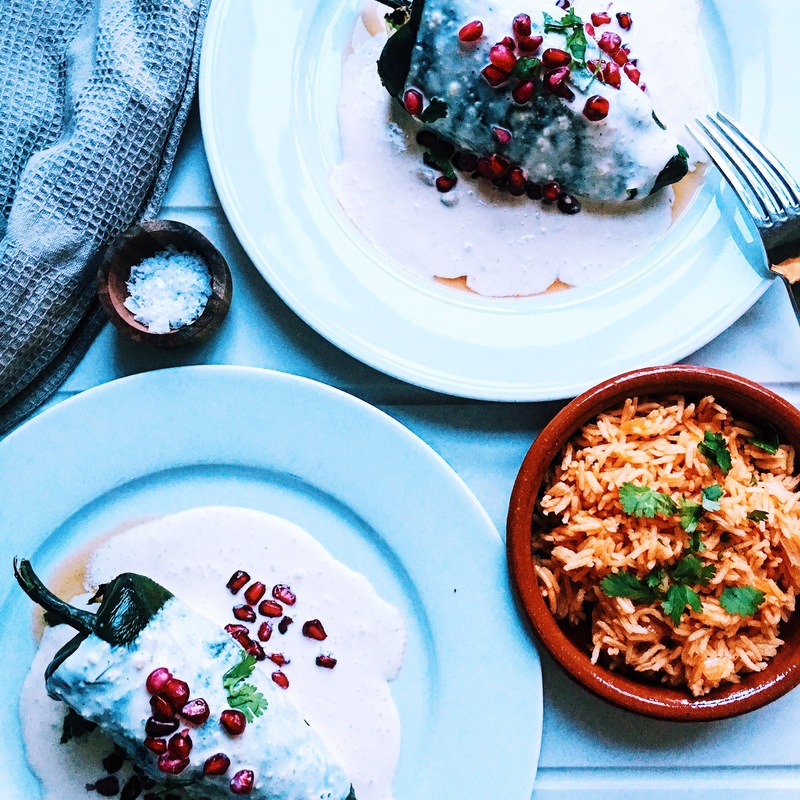 The history of the creation of Chiles en Nogada goes back to August 1821 when the sister of Santa Monica Convent in Puebla wanted to welcome Agustin de Iturbide. They collected some of the ingredients that were in season during the month of August and they came out with this recipe. The colours of the ingredients on it are related to the colours of the Mexican flag, the Poblano pepper is the green colour, the Nogada sauce is the white and the pomegranate seeds are the red, making it the most patriotic dish to celebrate Mexican independence.Traditionally the Chiles en Nogada are made with mince pork and mince beef, but today I am making a vegetarian version using mushrooms, I am trying to eat less meat and I thought that this is a good idea. Also in the traditional recipe, the peppers need to be coated in a soft peek egg mixture and then fried, but I decided to skip this step for a more healthier option. So here it is the recipe and if you are a Mexican I hope that wherever you are in the world you have the opportunity to celebrate the Mexican Independence Day. Viva Mexico! Chargrilled the poblano peppers on the burners of the hob. Turn them around so all the skin gets blacken. Once the skin gets this colour, put the pepper inside a plastic bag to rest for 15 min and take them out of the plastic bag and peel the skin off. Make a incision from top to bottom of the pepper and take the seeds out, leaving the steam on, leave aside. Heat a casserole dish or a frying pan and add the oil then onion and garlic, cook for 3 min, stirring. Add the chopped mushrooms and mix very well, cook for 10 min after that add the chopped tomato and cook for 3 min. Then add salt and pepper, the pine nuts and fresh coriander, cook for around 10 min turn the heat off and set aside. Put all the ingredients, goats cheese, single cream, salt, walnuts into a blender and blend until getting a smooth consistency. I find it easier to use the hand blender as I have more control over the mixture. Then assembled the peppers. Filled them with the mushroom filling until the pepper is well stuffed but holds everything inside the skin, cover the pepper with the Nogada sauce and scatter some pomegranate seeds and fresh chopped coriander. Enjoy them with some Mexican rice.